A painting friend recently asked for advice about what kind of tripod to buy for an upcoming trip to Spain. 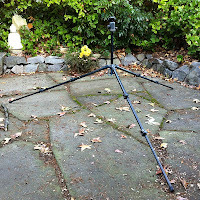 His question made me realize that while there may be plenty of information about portable painting easels there is almost nothing about what makes a good plein air tripod. The kind of easel my friend will travel with is a clamshell design, such as the Open Box M, the Strada, the Easy-L, the Alla Prima Pochade and the Guerrilla box, all of which require a tripod for support. Ideally, the point of an easel + tripod combination is to provide a compact outdoor studio that is easy to transport, quick to set up and tear down, using components which can be stowed into a backpack or roller bag. So the tripod you choose literally becomes the foundation for everything else. However, the quality of an easel is directly related to the amount you spend on it. I wish this weren't so, but this is why those tripods you can buy bundled with a clamshell easel just don't cut it. But you don't have to plunk down $600 to $800 to buy a tripod for plein air - you can get away with spending $250 to $350 for the tripod itself and perhaps another $100 to $150 for the head. So to purchase what will become the foundation of your outdoor studio will run between $375 and $500. I appreciate that is still a lot of money, and perhaps more than the easel itself, but if you are after stability, convenience, and durability it is the cost of admission. Aluminum vs Carbon Fiber Tripods: I've had both and only you can decided if the extra $$$ spent for carbon fiber is worth the lighter weight. I think so. Carbon fiber will weigh from 1 to 1.5 lbs less than its aluminum counterpart, and while at first that may not seem like much the difference becomes significant when you are on the move. Also, a carbon fiber easel will hurt less if you accidentally whack someone on the head as you walk down an airplane aisle. (Don't ask me how I know this, okay?) I have the same two Manfrotto models except one is aluminum and the other is carbon fiber. Which tripod do you think makes it out into the field more often? Plus, carbon fiber don't feel as cold as aluminum does when the temperature has dropped, your fingers have gone numb, and you want to go home. Load Capacity: This is how much weight the easel is rated to support. Manufacturers provide specs for camera weight but your easels weighs something too and what it weighs should be part of your decision. But wait, there's more to consider – you've got to anticipate the weight of your canvas (or panel) and consider that there will be days when wind will rock your easel while you work. So I always recommend a load capacity of no less than 11 or 12 lbs, with 17 lbs being even better. 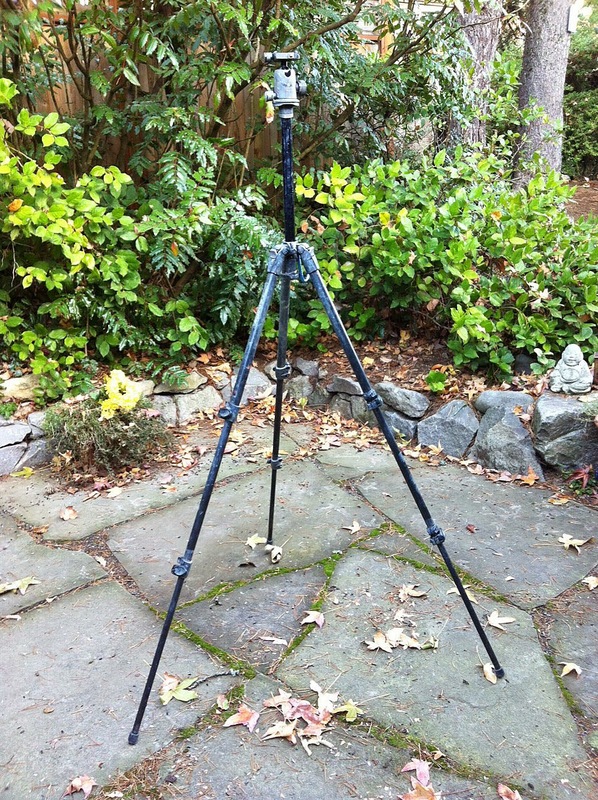 Height: You will want a tripod capable of raising your easel to at least eye height. You may believe that should be tall enough but I have run into situations where I've been painting on a steep slope and one of the legs has been pointed downhill and that loss of ground elevation required me to paint at chest level. So I don't recommend any tripod shorter than 60 inches out of the box, and frankly 63 to 70 inches would be better. You can expect a tripod head to add another 3 or 4 inches. Three Section vs Four Section Legs: For the most part, if all other specs are equal, the fewer the sections, the less flex there in the tripod. So see if a three section tripod works for you first. The problem with that fourth section is the diameter of it must be so narrow that the slightest breeze can make it bend. Even you pushing the paint around on your canvas can make it bend. Center Hook or Ring: It might seem a minor feature to look for but seasoned photographers who put thousands of dollars worth of glass on their tripods know how important it is to hang additional weight to prevent blow-down. Hooks or rings are important to you as well. Even the mildest wind can unexpectedly turn your painting into a sail and most blow-downs can be avoided if you take the time to hang some weight when you set up. So I leave a carabiner hooked onto my tripod's center ring. 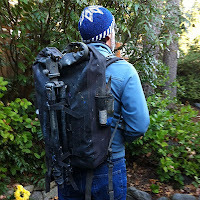 It makes attaching my backpack filled with rocks a simple and quick one-hand motion. Multiple Leg Angles: Preventing a blow-down is directly related to the area of your tripod's footprint. The wider the footprint, the less likely it will occur. Most tripods in the price range we're discussing have legs that can be set at 25º to 45º to 60º to 90º angles out from the center axis. (The left photo shows my tripod's legs set out at a 60º angle.) If the tripod you have been considering can't do the same then scratch it off your list and consider something else. This is another argument for purchasing the tallest tripod you can pack because, as you see in the image below, the wider the legs, the lower your easel will be. Two summers ago I was out painting some picturesque sailboats racing about on Chesapeake Bay under a few puffy white clouds. Then a squall blew in from the southwest. I wasn't finished and I liked the drama so I kicked the legs out wider and repainted the scene. (Note that I am painting on a 20 x 24 inch panel. Even with the legs spread out I had to hold onto the easel.) And minutes later I had to throw everything under my rental car before the squall line hit. Because of those legs I was able to finish the painting and hang it in a show the next day. As I mentioned at the outset, it is uncommon to find a tripod in this price range that comes with a head. This isn't bad. It just means the manufacturer has put the money into the tripod itself and is leaving it to you to decide what kind of head you want to attach. Metal vs Plastic: Most of the wiggle or movement you will experience with your 'plein air painting system' will occur between the top of the tripod and the bottom of your easel. This shouldn't be surprising because the tripod head is essentially a fulcrum point. So purchasing a quality head is important. Think of it as an investment. If you drop oodles of cash into a high end tripod but then go cheapo on the head you'll gain nothing. So buy a well made metal head. Sure, it will add more weight. But it will also clamp and hold your easel more tightly, and it will outlast any cheaper metal/plastic composite. My tripod head weighs more than my tripod. I am okay with that. Pan Head vs Ball Head: Ultimately, which one to buy is a personal choice But I prefer a ball head. Pan heads have two handles to adjust. And each handle can only move along one axis, making leveling out the easel a more complicated effort. Also, depending on the clearance the bottom of your easel and the pan head grips, leveling out can be difficult to do after you've attached your easel. Plus pan heads take up more room when packed up. Ball heads are more compact and allow you to level out your easel after you've attached the easel to the tripod – which, if you've ever spent much time setting up and tearing down these kinds of easels, is the order most people follow. (Pull out your tripod, set the legs, attach the easel, and level out.) 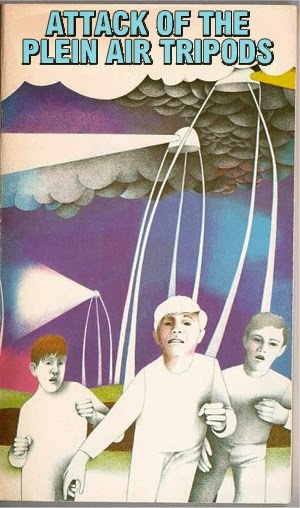 So I recommend you go for a ball head. Geegaws and Foofurawls: Those cute little bubble levels that come on some tripods? The ones which tell you when you are precisely plumbed out on uneven ground? Ignore them. They are there for the photographer or videographer who needs to sweep left and right with multiple shots to create a panorama. For you – the plein air painter – those little levels are of little use. Those little tick marks on the rotating collar? Do you really need to know you've rotated your easel seven degrees left instead of eight? If the head comes with them, fine. But I wouldn't pay extra for them. 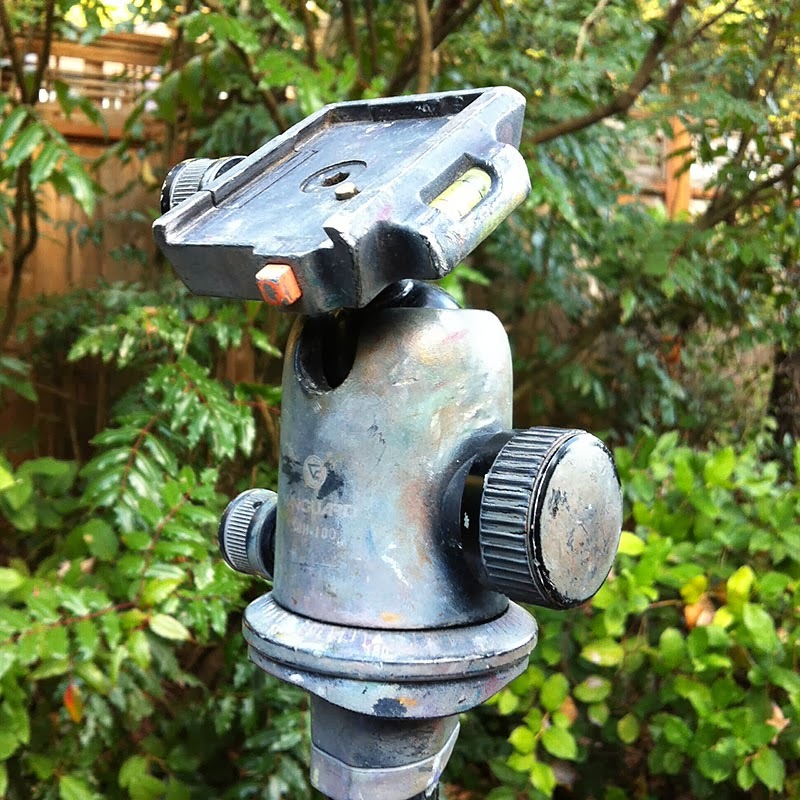 Quick Release Plate: An absolute and essential part of your new 'plein air painting system'. But again, metal against metal against metal. Not plastic. And consider buying more than one quick release plate when you are buying your tripod head. There is nothing more irksome than having to screw your easel onto the tripod by hand because you left your quick release plate at home on the family camera. My plate NEVER leaves the bottom of my easel. (In fact, I have two easels and two quick release plates and I should still get another one for the family camera.) But be aware that manufacturers use different shaped quick release plates so don't expect there to be a universal standard out there. It can be hard to find an additional plate years down the road. 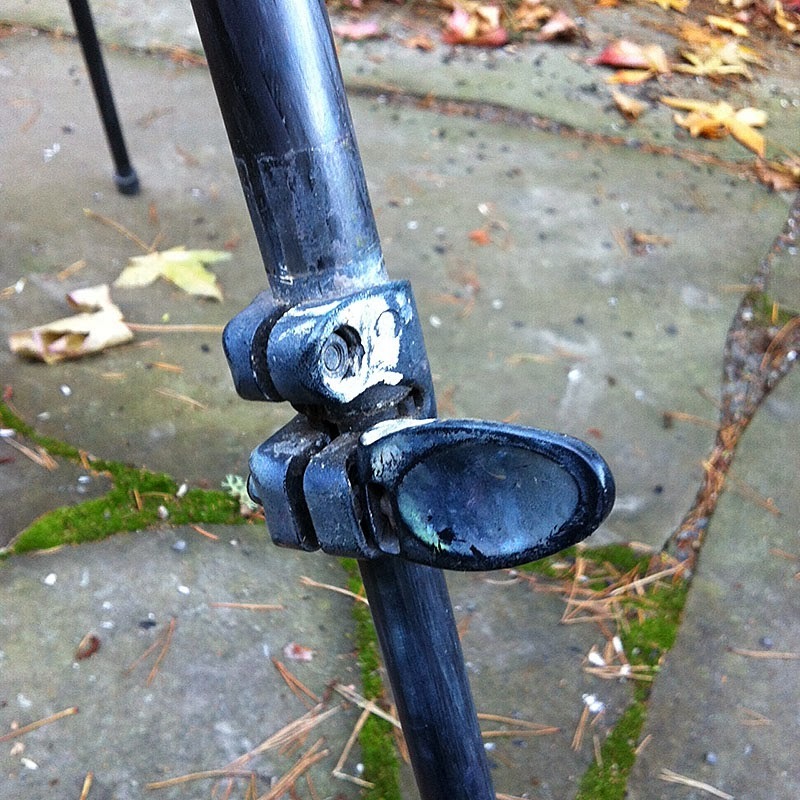 Every quick release plates attach to your easel using a threaded bolt. That bolt will either be a 1/4 or 3/8 scale. 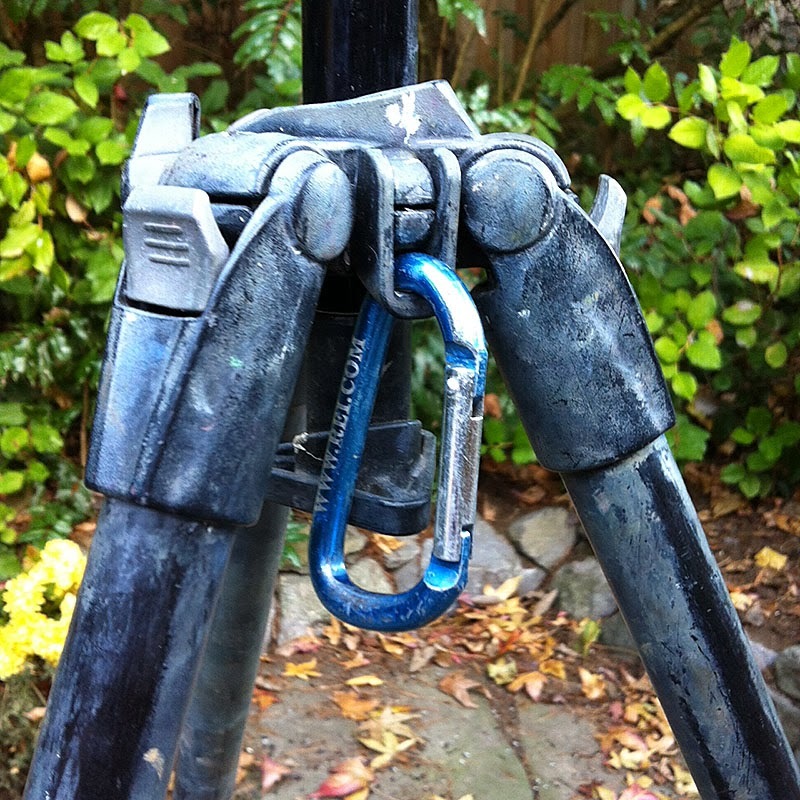 Check your easel mount to see what you need. How to Save Big Bucks: Just like you don't 'need' to buy a new car you don't need to buy a new tripod. 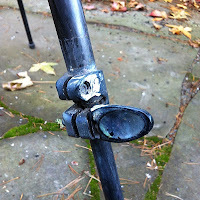 Like cars, tripods do not retain much resale value. 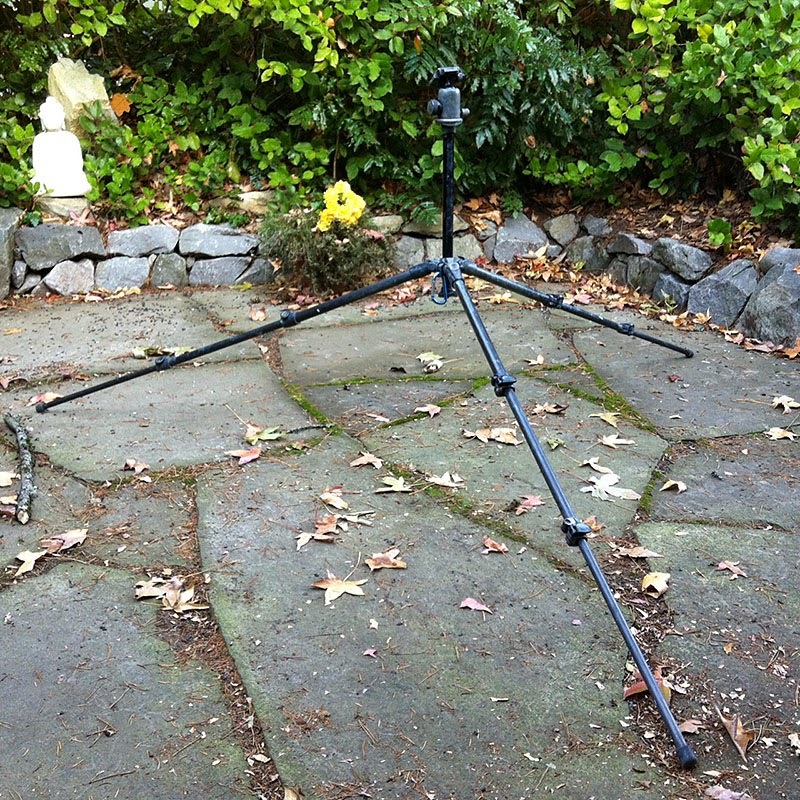 If you check Craigslist.com on a regular basis you will find many suitable tripods for sale by photo enthusiasts who want to drop some gear or wish to upgrade from what they have. So if you see a used tripod that fulfills the requirements listed above, and if it is in reasonable shape, then buy it! 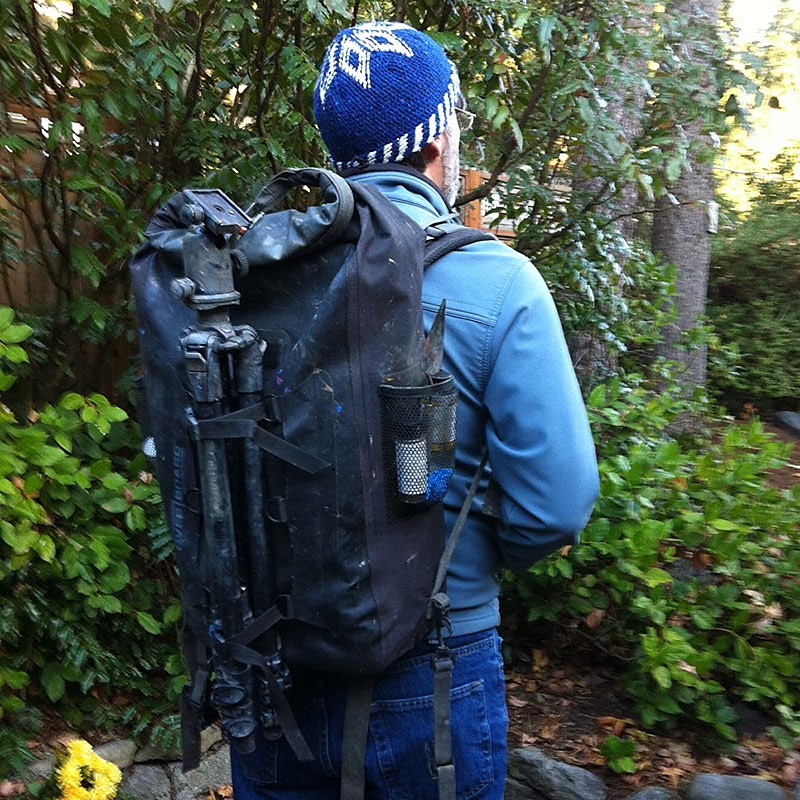 *In that photo: my backpack contains one Open Box M easel, six pound tubes of paint, dry clean rags, one empty OMS reservoir, one case of long handled painting brushes, and other miscellaneous items. 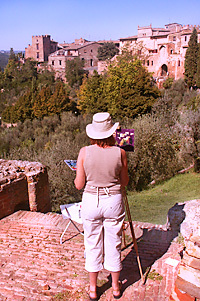 If you would like to work on your plein air skills with me next May in Tuscany check out the upper left corner of this blog. Spouses and partner welcome. Cost is inclusive, and options from €1640 to € 2400. Very valuable information. Thank you for sharing your insight and knowledge on the subject. I echo the previous comments great info. Having looked at your choice of easel the Manfrotto 190 CX Carbon Fiber, I noticed that it is slightly shorter then the 160cm you recommend in the article, and that the max load is at the bottom end at around 11lbs. Have you ever had any problems using your Open m box with this easel? I'm considering the Manfrotto MT190XPRO3 (recommended by open m) which has a height of 160cm and a higher max load of around 13lbs, but is a bit heavier at 2kg. Also i'd be interested to know which ball head you use with your tripod? Joseph, ALL clamshell/tripod systems will wiggle a little bit as they all have the same design issue: the connection between the two is reduced to a single point where the tripod screws on to the bottom of the clamshell. There is no triangulation at that transition. Your best bet for minimizing wiggle is to purchase a quality three section tripod (to minimize compression or sway in the legs) and an all metal head that has been machined to a high tolerance. And to go for a high load capacity and hang a weight off the center of the tripod if there is wind. (I hang my backpack or a nylon bag filled with rocks or sand when necessary.) Works well. In the end, the portability and ease of the clamshell/tripod set up outweighs the minor wiggling they ALL exhibit so don't worry about it and go for what we've discussed off line. I am confident you will be satisfied and never go back to your French Easel. I certainly haven't. If you go for the OpenBox M tell Doug hi from me. If you go for the Strada tell Bryan hi from me. If you go for the Easy-L M tell Penny hi from me. Good luck and let us know how things go! The is so much Thomas!!! So glad I found this!! I need a new tripod and this was the perfect post! Thanks for the review. Looking forward to my new tripod. Replacing my older carbon fiber travel tripod that had twist legs that finally broke down. Glad the review was helpful. Gear will wear out if you use it enough. Let me know what you end up buying.